Hi! This is less invasive than gnome-terminal-fedora, because it doesn't include the notify-feature. Therefore you can stay with the regular vte and vte-common! To fullfill the makedepends you probably need to install the packages 'itstool docbook-xsl appdata-tools yelp-tools', they can be removed when makepkg was executed successfully. Please ensure that you have installed the package group 'base-devel', which is a requirement to use AUR. Top: Workaround with devilspie, fore- and background are transparent. 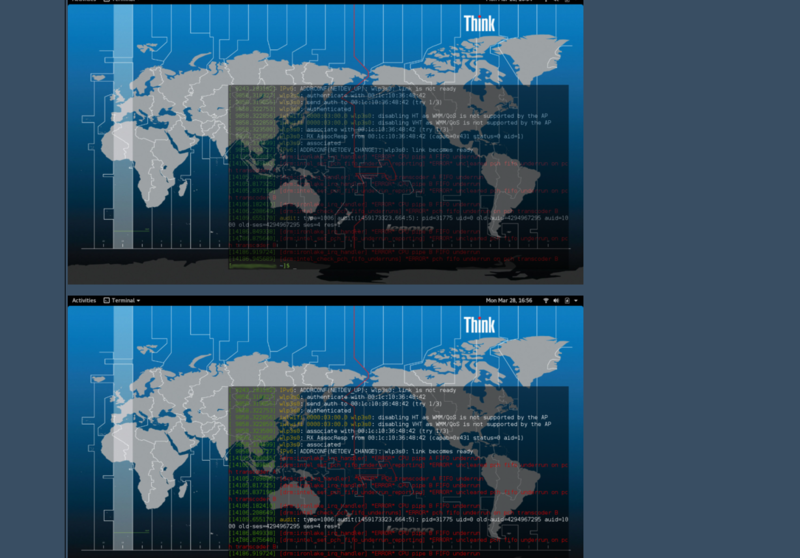 Bottom: Background transparency with gnome-terminal, better readability. Hello! The distributions you named are derivatives of Archlinux, while reading your comments I'm presume they don't keep their packages in sync with Archlinux. Setmurphy18 quickly figured that out, that's why he/she edited the comment. You can fix you issue by using the older snapshot of the package, which I already posted. Just copy the full link, including the tar.gz at the end, you will end up with "3.32.0-1" instead of "3.32.1-1", that should fit well to your older packages. I keep the dependency on vte tight with upstream, maybe I'm a bit to strict. Sorry, my distro is manjaro. !!! Is there any way to warn the manjaro people about the lack of synchronism in the packages? I noticed a previous error in Manjaro by user sethmurphy18, but I am not sure what the error was, so I decided to post this anyway. @sethmurphy18: You can still download here the previous release, I think that's the best approach as long as Manjaro doesn't update their mirrors. When you're using Wayland, you will probably see a white rectangle behind the popover menu. I hope we can fix that soon. I just fixed it, it was because my PKG_CONFIG_PATH variable was bad defined and it couldn't find the required files. Yes, looks like GNOME is not installed, but I'm already using GNOME and it's installed with the GTK libraries. I thought that maybe it's because I was using the Plasma session in that moment and I tried again with the GNOME session with the same result so I disabled SDDM and I enabled GDM and I started the GNOME session again to try to install gnome-terminal-transparency but it returns the same. The package requirements are not fulfilled. Looks like GNOME is not installed?